This is the first of a two part article that looks at how DJs can build a name for themselves through the traditional and modern routes. Part one looks at how traditionally DJs have gone on to build careers in a world before the internet and since its inception. Part two will focus on how to capitalise on social media and digital tools to reach a wider global audience. Let's get started on the more traditional methods some of which are just as viable today..
For anyone under the age of 30 it might seem like the web has always been around. It is something we take for granted and even though it is good fun to joke that the first few years of the web were in black and white and would turn off at 11pm; it is a serious business, especially for the modern DJ. Before the web DJs built huge reputations - often via word of mouth - going all the way back to the early seventies and the Northern Soul scene where they reached cult status. The BBC documentary ‘Northern Soul: Living for the Weekend' is a testament to that and well worth a watch on how DJs were truly central to the development of a scene. 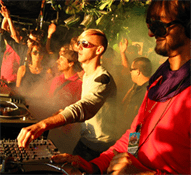 The acid house and rave movements hosted the golden generation of high profile DJs, many of whom have gone onto be household names with healthy bank balances as a result. This was all achieved by a small collection of nights that flourished into large professional clubs and huge open air raves. Names such as Rampling, Tong, Cox, Oakenfold and Sasha were just a few of the DJs to create a legacy that has lasted decades. This version of profile building continued right up to into the late nineties with the post rave movements of garage, drum and bass and progressive house. It was no longer just a handful of DJs building a strong presence on the scene but hundreds of them, from all over the world. This was achieved with a combination of promoting club nights, radio airplay, mix CD and tapes, and in time their own music productions. Add to this the constant instrumental importance of word of mouth from clubbers who witnessed their DJ heroes play live. Use word of mouth, create a buzz, it's just as powerful now as it was back then. It takes time but it works. Radio has always been a very important part of alternative music scenes from the pirate stations of the sixties to their web counterparts today. In the late eighties and early nineties pirate radio played a pivotal role in the UK rave scene by giving dance music fans a chance to hear music that legal stations were ignoring. In addition they became a hub to connect DJs, promoters and like-minded music fans that would go on to form record labels, club nights and fanzines. Radio may have lost that nervous edge that went hand in hand with the illegal raves but it still remains an incredibly important conduit for DJs to reach audiences and build careers. Fast forwarding twenty years since most of the major pirates ceased running and stations have resurfaced on the web, and with it a fresh look. Now DJs can play from the comfort of their own home without the fear of being arrested or having to venture into dubious locations unsure whether they would get out with their record collection in one piece. Mix tapes and CDs were and still are an important part of many scenes, from hip hop to rave mix tapes. In the nineties there was an insatiable appetite for the latest mixes, most of which were produced by a modern day cottage industry. Naturally platforms such as Mixcloud and Soundcloud have removed much of the need for burning off hundreds of CDR mixes, but mix CD and tapes still have an allure for many music lovers. A testament to that is the release of The Fatboy Slim Collection which is a mix of his favourite party classics, that has even lead to a national television advert in the UK. The mix CD might not be as popular as it once was, but it is far from dead as a way for clubbers to get a fix of their favourite tracks in club format in the daylight hours. Since the glory days of acid house and rave, the web has facilitated a wealth of opportunities for DJs to reach audiences across the globe. The global DJ phenomenon might predate the internet, but it has grown at a rapid pace since those connections became electrified. Nevertheless the web alone is probably still less likely to get you your first gig by a promoter than the traditional routes that are still core to any scene. The hard work of running nights and events is still key, the web helps build that imprint and something followers can tap into outside the actual event. Naturally platforms like Facebook can help create a buzz and promote a night, but for people to come, they have to know about the DJ first and foremost. It is a DJ's modern shop window, with mixes, updates, photos and video footage to help create the excitement. Given that hosting any kind of media content is free these days it would be counter-productive not to take advantage of it. As with the traditional methods of reaching out to people there are the by-products of making connections with like-minded music lovers. As the saying goes, ‘no man is an island' and for any fledgling DJ, isolation is good if you want to remove yourself from influences, but it makes getting further up the ladder that bit harder. Most big name DJs have to got to be where they are by forming alliances with promoters and other fellow DJs and musicians, there is a genuine strength in numbers. They all may not be in it for the same reasons, the love of music, money, drugs, fame, girls, boys - delete as appropriate, but they will need to find common ground with fellow DJs to achieve it faster. For the most part, DJs are social creatures, it goes with the social aspect of clubbing and music. So by finding out like-minded souls you not only create opportunities to play out, but discover and create music as well as start collaborative club nights. In the eighties and nineties it was the record store that nurtured a lot of those connections, these days with the demise of many regional independent stores it is likely to happen over the web. Digital DJing removed many of the barriers to entry level mixing thanks to cheaper equipment and access to individual tracks, rather than often expensive 12 inch imports and albums. This has naturally lead to a crowded but vibrant global market with a lot of DJs vying for attention, everyone from the small time bedroom hobbyist to the big time professional in the same locations. Of course not every DJ has ever wanted to convert their passion into a more serious hobby and in turn career. Yet it does happen more often by chance than we would probably imagine. I started DJing for the very simple reason that I wanted to hear music I loved on a loud sound system. This was without giving much thought into it being a paid venture, which it eventually became. The tried and tested methods of profile building still very much exist, including hosting and playing at club nights, creating mixes, music and radio airtime. The web has opened the door to a whole new set of opportunities, many mirror the old school ways. And whilst the web might aid the path to success it can also be the platform on which it is built. Some DJs have created digital platforms that have in time blossomed into real life ones that include all of the traditional methods of club nights, DJing out and label imprints. A great example of this is CPU Records label owner and Computer Club host Sheffield Bleep. The Sheffield-based DJ built much of his career through carefully honed digital and occasional vinyl mixes that were hosted on such as Soundcloud. Many of these mixes have been listened to in excess of 4,000 times and helped build a profile as a DJ with not just a great taste in electronic music, but the art of curating faultless mixes. Since then Sheffield Bleep has run a successful electronic label with over 20 vinyl and digital releases - that have received excellent reviews in the independent music press - and a popular electronic night in the Steel City. It has also led him to be invited to play guest sets at other reputable techno and electronic nights. This success has come from a carefully built social media profile that has flourished into the more traditional methods of promotion and networking. Both routes into creating a DJ profile, digital and traditional can work fine, but could be better when combined. Whether you start by building an online profile or by grassroots playing out and starting nights and labels, the main thing is to love what you do. Playing out in clubs is a superb way to build a career, as it helps hone DJ skills from mixing on large sound systems to learning how to use different DJ technical set ups. It also helps build a contacts list of promoters and fellow DJs both offering opportunities to play out more often. Whilst the web provides that online alternative with tools like uStream where DJs can stream anything from a club night to playing in their own house across the internet. Tools that work with SoundCloud and YouTube such as Plug DJ create a listening space for DJs and music lovers to playlist, interact and support each other online with very little pressure. There is something for everyone and more levels of entry than ever before, it just needs application, time and common sense. The one thing that has changed from the days before the web is that DJs can reach people even if they just want to stay in the confines of their bedroom. Next time we will look at some of the social platforms DJs can use to build a profile and reach audiences with minimal effort.